THREE local apprentice chefs are today vying for the title of ETC Apprentice of the Year during a public cook-off competition to be held at Coffs Central Shopping Centre. A second year apprentice with The Hilltop Store, Nicholas will be preparing roasted king prawns with desert oak butter and sea succulents. La Piazza, first year apprentice, Brise, will be creating lemon myrtle prawns. Sugarmill's 2nd year Apprentice, Mitchell, will be creating vongole, served with lemon myrtle beurre blanc, with baby radish and toasted sourdough. The Cook-Off will be judged by local Chefs Darren Ryan from Bonville International Golf Club, Scott Hardy from Depot at Coffs Central and Cheryl Patrick from The Cheesemaking Workshop. "When you work as an Apprentice Chef your work routine consists of very repetitive tasks. It can become frustrating sometimes not to be able to express your creativity. With this cook-off, I wanted to be able to give the Apprentices a chance to have some fun and showcase their skills," Mr Philip said. "As an apprentice chef I had the opportunity to take part in a few culinary competitions. It was an extraordinary experience that helped me gain confidence, experience and enabled me to meet some amazing chefs," he said. "Competitions enable young chefs to perform in an environment that puts them up against their peers and out of their comfort zone, which is a great challenge." ETC's CEO Jenny Barnett praised each of the contestants for entering the competition and congratulated the finalists. "It's a fantastic achievement to make it this far and we encourage the public to come along and get behind their local apprentice chefs," Mrs Barnett said. "Each of the finalists will receive a $150 gift voucher and the winner will receive an additional $150. "We would also like to thank Great Ocean Seafood and The Provedores for supporting the Apprentices by supplying ingredients for their recipes." The cook-off competition will be held in Coffs Central from 10.30am - 12.30pm. 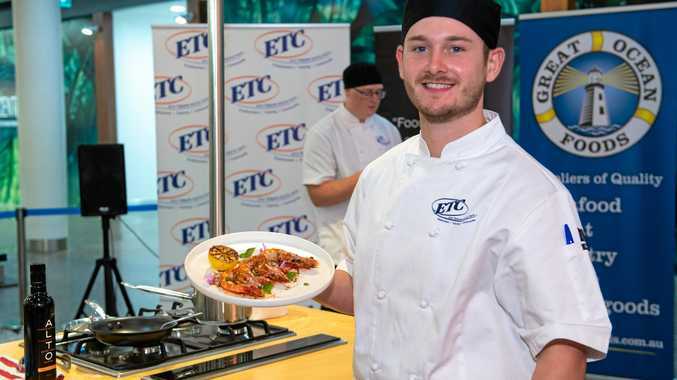 The winner of the Coffs Harbour cook-off competition will go up against the winners from the Port Macquarie and Lismore regional finals, with the ETC Apprentice of the Year to be decided at the Grand Finale cook-off to be held in Coffs Harbour in July. If you are interested in becoming a Chef, or signing up an Apprentice Chef in your business, or would like to learn more about ETC's Apprentice of the Year Cook-Off competition, contact ETC's Training Business Relationship Manager, Karen Jackson, on 0408 893 694.